In its 400 years of history, Wotton House has been everything from a spectacular home to a school for firefighters. These days it's a beautiful country house hotel, and Annunciata Elwes paid a visit. As the birthplace of John Evelyn, 17th-century landscape gardener and diarist, Wotton House has dipped more than a grotto (it has two) into the firmament of Surrey history. Extended in the 18th and 19th centuries, and restored in the 1870s after a fire, there is much that Evelyn wouldn’t recognise about the house today, with its Victorian mock-Tudor façade, octagonal turrets and winged griffons. Nevertheless, its reincarnation as the De Vere Wotton House hotel, following decades of use as a Fire Service College and a period of neglect, is most welcome. 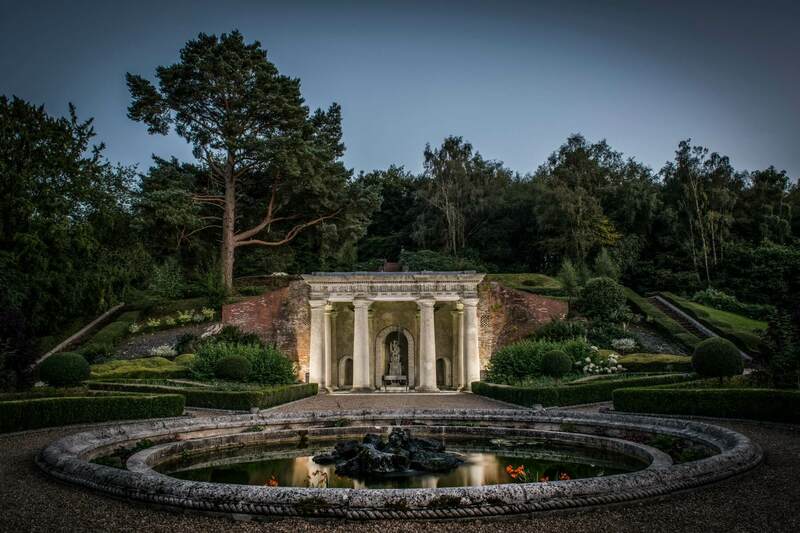 Part of Evelyn’s legacy, the first Italian garden in Britain, remains, with 12 acres of Grade II*-listed grounds that include sweeping lawns, woodland, terraces, ponds, temples (lit at night), grottoes, bridges and streams. It was into this fit-for-frolicking landscape that we launched our new puppy – his first trip to the countryside. He loved it – ‘chasing’ sculptures, barking at ducks, eating dandelions – just what the gardens where meant for (possibly). A large dog bed had been thoughtfully placed in our room and the staff cooed over him just the right amount – enough for him to feel suitably spoiled, not too much that he felt crowded. After a recent £6 million refurbishment and redecoration, there are some striking features indoors, too, including a Gothic former library with stone pillars and a vaulted ceiling, which is popular for weddings. The Roman-style temple in a pretty walled garden is the outdoor option. The decor is simple but fun in a mostly tasteful way, albeit with a few odd choices thrown in – for example, I’m not sure a huge gold mirror with neon writing inside it about a ghost has much place here. With the delights of Box Hill on the doorstep and bicycles there for the borrowing, as well as wellies, umbrellas and walking sticks, it’s a lovely base from which to explore the Surrey Hills AONB. And at a mere hour’s drive from London, Wotton is an easy escape. 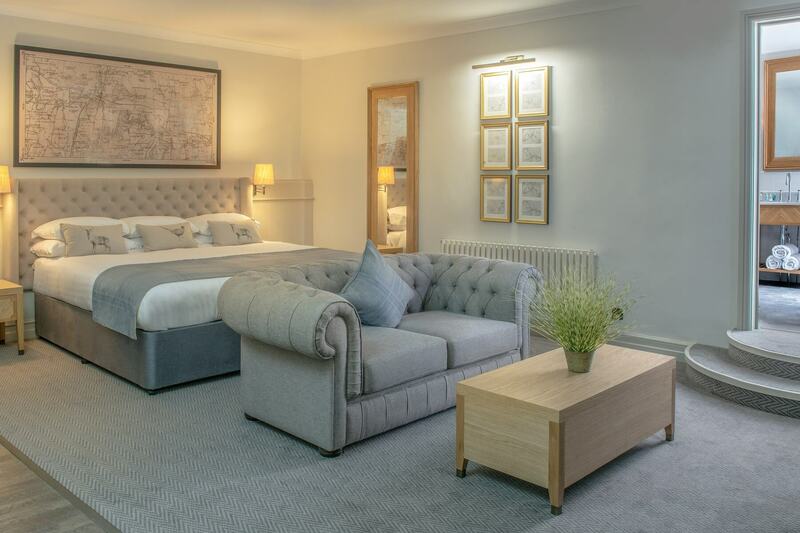 Rooms at The De Vere Wotton House start from £129 – see www.phcompany.com/de-vere/wotton-house for more details. Before dinner, we relaxed in the pretty Orangery bar facing ornate windows and the verdant great outdoors beyond. The modern-classic 1877 Restaurant, although large, was buzzing – obviously a popular haunt for locals, not to mention guests (the hotel has 127 bedrooms). 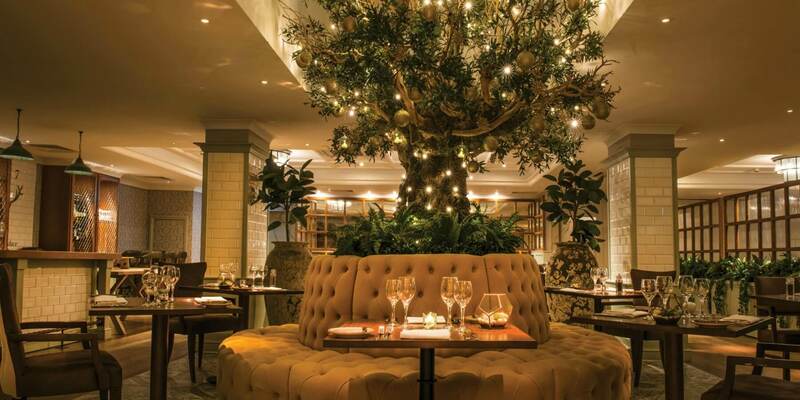 In the centre is a large, beautifully lit tree and the traditional-with-a-twist menu included everything from glazed beef cheek to Jerusalem artichokes. Everything we tasted was delicious, and the extensive breakfast buffet followed suit. An illustrated walking map of the estate is provided to all guests (there’s an equivalent for cyclists too) with helpful things like local pubs – The Stephen Langton Inn and Wotton Hatch Pub – ponds and a waterfall marked out. The footpaths are clearly marked, too, with colour coding for categories such as ‘short ramble’, ‘walk to pub’ and ‘long walk’. Beyond the Wotton House estate lie the Surrey Hills, one of the first landscapes to be designated an AONB (Area of Outstanding Natural Beauty), in 1958. Cyclists are spoilt for choice, with mountain-bike trails and the legendary Box Hill, while the the National Trust’s majestic Leith Hill Tower and its surrounding heathland and woodland are also nearby. Also very close by is the Denbies vineyard, while the charming, antiques-shop-peppered market town of Dorking is also well worth a visit.